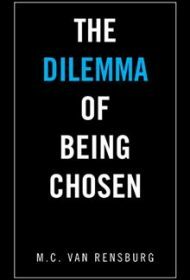 Author Marius C. Van Rensburg opens to readers an aspect of Christian theology that is often overlooked in churches today: the notion that God “chooses” believers for a unique assignment or destiny. In addition to God’s choice of vessel and His purpose in making the choice, he asserts that a third element exists, creating a triangular model. That third “side” is God’s favor, which provides the grace and strength to accomplish the purpose God designed. The Christian’s part is to submit to the process through the exercise of our free will and our desire to have greater intimacy with God. Van Rensburg is a graduate of the Rhema Bible Training Centre, South Africa. He opens each chapter drawing on biblical accounts of Mary, the mother of Jesus, and Joseph, eventual ruler of Egypt. In his preface, he gives a disclaimer that he has partially fictionalized these accounts, but in fact he has used the style of narrative nonfiction to draw out his own conclusions about how these well-known personages might have felt, reacted, and thought as they navigated the unusual paths God chose to put them on. He goes on to explain that being chosen and receiving favor toward a specific Kingdom purpose is rarely comfortable and is always disruptive. This, then, is the dilemma: the struggle we face to make the transition from where we currently are to where God designed us to be. Van Rensburg presents his case with excellent scholarship, clear examples, accurate biblical theology, and persuasive arguments. Especially interesting are his chapters on prosperity from God’s point of view, what it means to glorify God, and the importance of being present in our own lives in order to fulfill the role assigned to us. At times, his language leans into the flowery vocabulary of an academic, but this is easy to overlook. Christian believers or curious seekers will find this book deeply compelling and even, perhaps, life changing.